Spring is in the air for many of us it seems, and why not since the snow continues to melt outside with above freezing temperatures and the sun's increasing heat. With the change of the season, comes the excitement of activities and sports to come ... whether golf, soccer, walking, hiking, cycling, and more! During this time of year I have historically found an increase in shoulder injuries on my physiotherapy caseload. For some individuals it stems from inactivity during the winter months, followed by rapid return to activities or sports (e.g. spring clean up & car washing; hitting the driving range with your woods instead of easing in with your irons; household spring cleanup, especially the whole house or yard in 1 day; etc.). While others may have sustained injuries and difficulties during recent months. Regardless of the reason, or the level of activity you wish to return to, the season change and a recent blog article from a fellow physiotherapist, in Boston, sparked this week's blog and article link. For those that seek out physiotherapy help for shoulder pain and functional recovery rehab, understand the benefits and key pointers that can sometimes make or 'break' (stall) your recovery to 100%. Unfortunately when pain goes away, we do not always keep up our rehab exercises, and fail to reach 100% recovery. This is often the source of many bad habits and bad movement patterns develop. 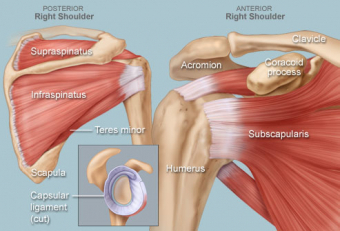 Why is the shoulder so complex? The simple answer is that yes it is complex, anatomically that is. Your shoulder can move in 3 planes of motion, making it one of our body's most limber and mobile joints. In this lies the challenges at time in diagnosing and recovering from shoulder injuries that 'come on slowly' or do not have a history of falls or trauma as the source of injury. Your rotator cuff, really IS a cuff, in which muscles and ligaments form a 'cuff' around your humeral head (upper arm bone). Not quite as previously assumed: separate muscle that all attach around upper arm, which share the function of supporting and rotating your shoulder. (See picture for better understanding of the 'cuff' concept). So before you jump in to your activities and training this year, check out Mike Reinold's article: The 5 most common mistakes people make returning to training after a shoulder injury.